For many English people, it is one of the most shameful incidents in the history of football. For Argentinian supporters, it is seen as one of their greatest moments. So, what happened? The incident in question has become known as the “Hand of God goal”. It all happened during a quarter-final, World-Cup match in Mexico City between England and Argentina in 1986. Argentina eventually won the game 2–1, but the match was full of controversy. At the time, tensions between England and Argentina were high because of the Falklands War (La Guerra de las Malvinas), which had taken place just four years earlier. Six minutes into the second half of the game, the score between the two teams was 0–0. Suddenly, Argentinian Diego Maradona chased a lobbed ball into the penalty area. Once there, he was confronted by England goalkeeper Peter Shilton. Shilton had a considerable height advantage (he's 185 cm tall), and he was a clear favourite to beat Maradona (who is only 165cm tall) to the ball. 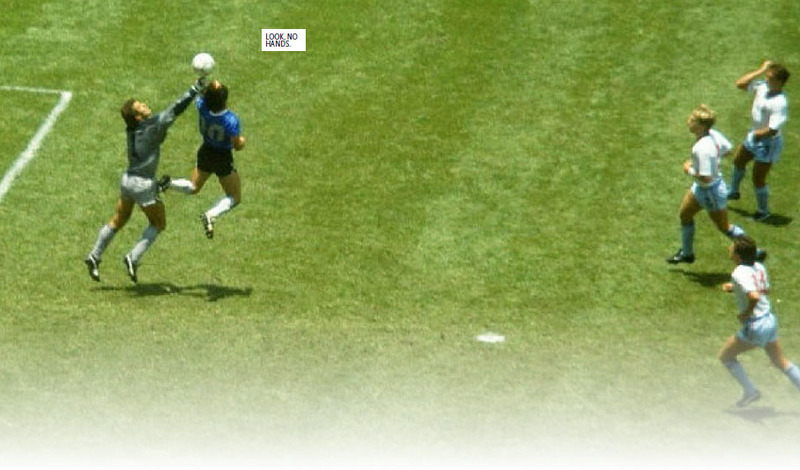 However, Maradona reached for the ball with his left hand, and it went into the goal. The referee (Tunisian Ali Bin Nasser) didn’t see the handball and allowed the goal. The Argentine players and fans celebrated. The English players protested.